coronation as king of Upper and Lower Egypt is depicted. Usermaatre, Son of Re, Ramesses (II) Meryamun is here seated on a throne and wearing the double crown representing the duality of his kingdom. In his hands he holds two, uncrossed scepters. He is flanked by two seated, female gods who grasp his shoulders. The goddess that he faces, to the east, is Nekhebet, mistress of the South. She assures him of her protection by "joining with his limbs" and of "his rejuvenation in the image of the Aten disk in heaven". 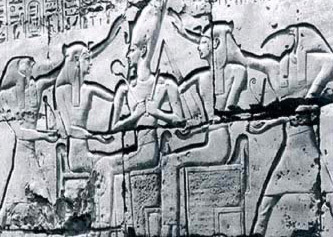 Behind her, Horus of Behedet reaches over Nekhebet to present Ramesses II with the white crown set on a basket. The goddess to the west is Wadjet, mistress of the North. Behind her, Thoth is presenting the red crown to the king, while confirming his divine origin and the righteousness of his rule over the Two Lands. The three thrones of the king and the two goddesses rests upon a single pedestal, while Thoth and Horus stand on the ground.